The actor who plays young Bruce Wayne in Gotham, David Masouz, gets possessed by evil spirits for the second time in the span of a year in Incarnate, San Andreas director Brad Peyton's latest offering to that sect of horror cinema. That there's such a difference between the taint of the tribal gods found in Darkness and the exorcism slant in this one can be seen a testament to the subgenre's versatility, populated with different sorts of malevolent spirits and the diverse havocs they can wreak upon those caught in their grasp. Unfortunately, similarly to how Darkness reuses the sort of moving parts found in Poltergeist, there's also a point-by-numbers rhythm to the way that the demon removals transpire in Incarnate, deviating little from the anticipated investigations and the mystical battles that emerge against the spiritual threat. The weathered, albeit muted charisma of Aaron Eckhart and the dreamlike depictions of the spaces inside the afflicted people's minds aren't compelling enough to change that, either. Eckhart fills the role of Ember, a handicapped scientist who specializes in the "evacuation" of spirits possessing other individuals. Through a series of wires and connections through his wheelchair, Ember does this by directly tapping into the subject's mental space, which opens a small window of time for him to both lead the subject to safety and to purge the demon from the body. While Ember and his ragtag team of punk-rock assistants derive satisfaction from the process of helping others with such occult matters, Ember continues his pursuits in search of a specific demon named Maggie, an entity who played a crucial role in his crippling injury and his solitary lifestyle. It just so happens that a representative of the Vatican drops in on Ember to tell him about a young boy, Cameron (David Masouz), who has been overtaken by a powerful spirit. Normally, Ember would steer clear of the church's offers, but name-dropping his nemesis Maggie intrigues him enough to investigate the boy. Ember's use of pseudo-technology and his non-denominational, insistently anti-religious approach to purging spirits from human bodies are what distinguish Incarnate, the things that provide updates and twists to its unshakeable influences. Feeding off the energy of AWOLNATION's vigorously amped-up ballad "Sail", director Brad Peyton accentuates the film's unique attributes through a shot that transitions from a possessed individual to a club sequence with Ember standing upright, which lands on just the right combination of inventive style and B-movie silliness. Complete with club atmosphere panache and precise hand-to-hand combat, the scenario immediately recalls The Matrix and/or Inception in both form and function. 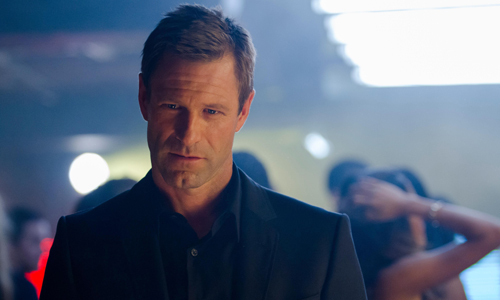 Emphasizing this out-of-body, surreal place as the film's designated battleground atmosphere leaves an exciting impression, heightened by its first glimpse at Ember's true state, which trades out Aaron Eckhart's traditionally attractive close-cut hairdo and a snazzy suit for long, stringy hair and an unkempt wardrobe. Even with the efforts of Aaron Eckhart embodying this uniquely resolute demon hunter and Game of Thrones' Carice van Houten lending credibly burdened strength to the young boy's mother, the appeal of this warfare going on inside the possessed people's minds in Incarnate has limitations. Underneath the film's mildly imaginative application of science-fiction tropes to the horror genre still lies the rusty moving parts of an ordinary exorcism movie, propelled by an occultist investigation with foreseeable findings and a race against time that's dragged down by the lack of surprise in what awaits Ember at his destinations. Further battles within mental spaces aren't as enlivened and hands-on as the initial one, either, which rapidly diminishes its potential horror-action energy, instead focused on Ember's psychological manipulations and the character drama within which he interacts. Tapping into themes of parental relationships and mental trauma in the wake of child abuse, gloomy tones swirl around heavy-handed, unimaginative detours through Cameron's mind, which aren't as engaging as the first bout. Incarnate blends the spooky noises of a creaking house, levitating bodies, and snapping bones with the expressive components of its horror-themed narrative, holding onto enough intrigue to follow along with Ember's self-destructive tactics in trying to get mystical revenge upon his targeted demon. Unfortunately, the script from Passengers writer Ronnie Christensen -- the Anne Hathaway one -- becomes too audacious in its twists and turns, producing a cascade of silliness in its conclusion that undercuts what came before it, dragged down by unnecessary bleakness and a trite, transparent attempt to fake out the audience. This likely would've been even more frustrating had Incarnate better succeeded at earning investment in the characters and the universe that's been created. Here, an ambiguously nihilistic ending becomes a bothersome way of ruining the serviceable exorcism thrills executed by Brad Peyton beforehand, much too vulgar a display of raw shock value for its own good.